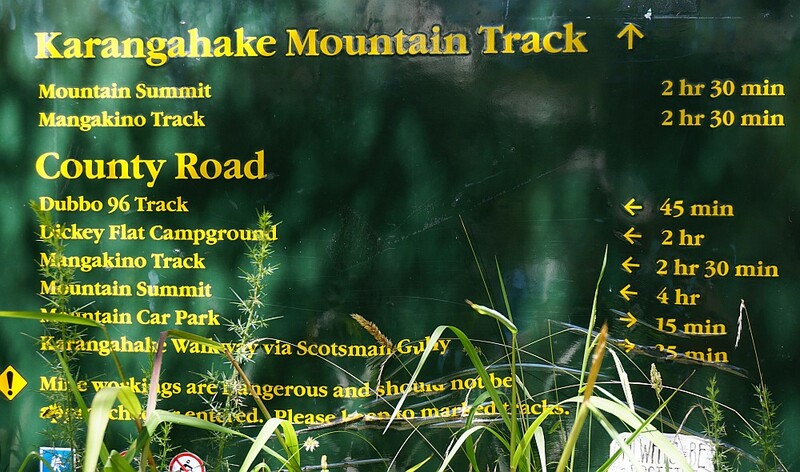 The street and track naming in Karangahake can be confusing, and the maps and signs do not always agree on the names. County Rd is actually a short road, and only joined to the track of the same name by Crown Hill Rd. It is possible to start and end the walk from a small parking area at the end of Crown Hill Rd. 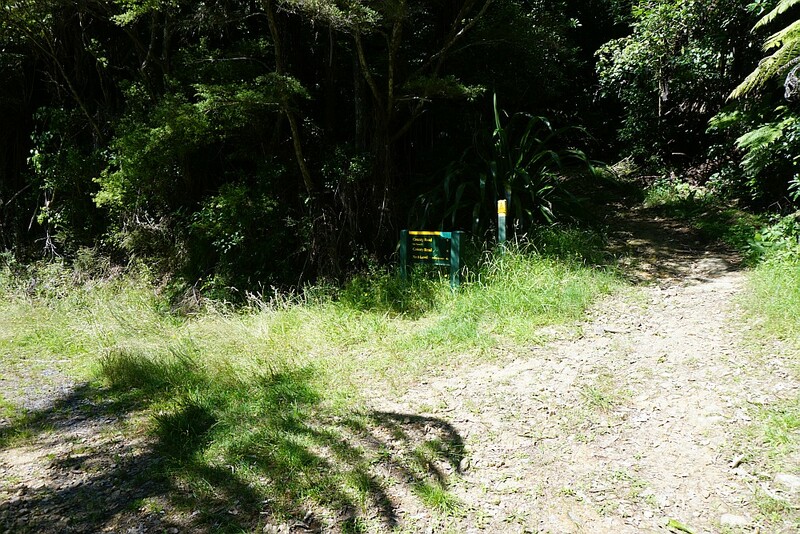 This walk started at the parking area off SH2 at Karangahake, crossing by suspension bridge over the Ohinemuri River. The parking area is often full on summer weekends. 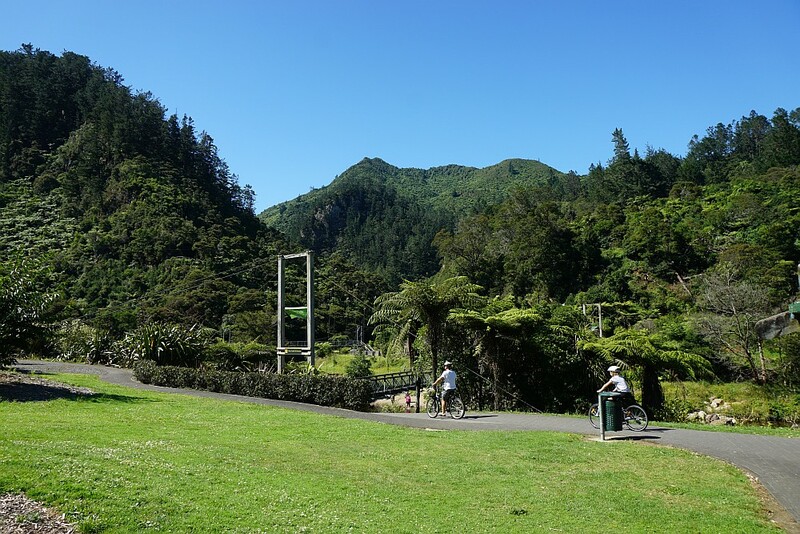 More parking is available off SH2 a few hundred metres closer to Paeroa by crossing the two-level bridge on Crown Hill Rd over the Ohinemuri River. There are toilet facilities at both parking areas. 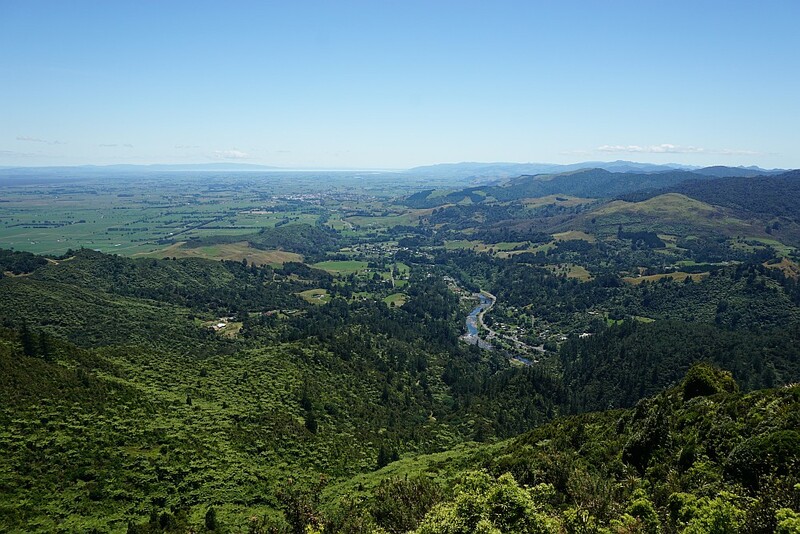 View across the Ohinemuri River from the Karangahake Reserve by SH2. The summit of Mt Karangahake is visible as the two peaks above the suspension bridge. 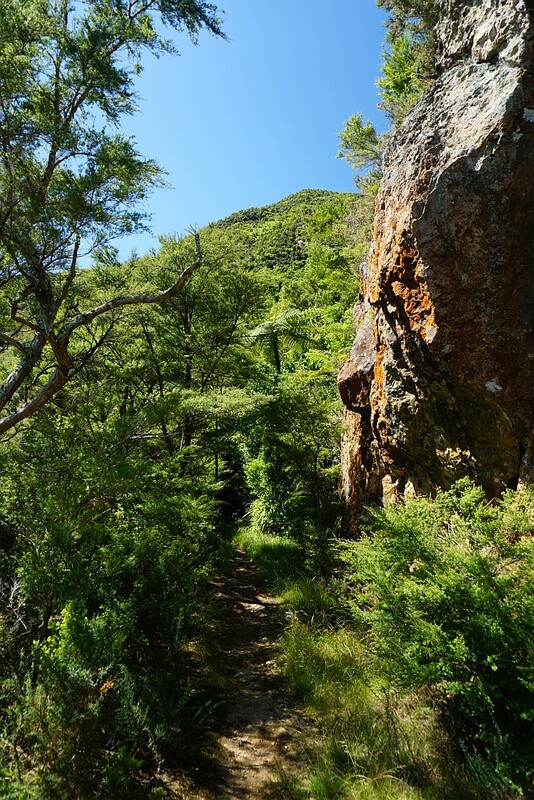 The track to Crown Hill Rd and the County Rd track passes through Scotsman Gully. The track starts between the two information signs. 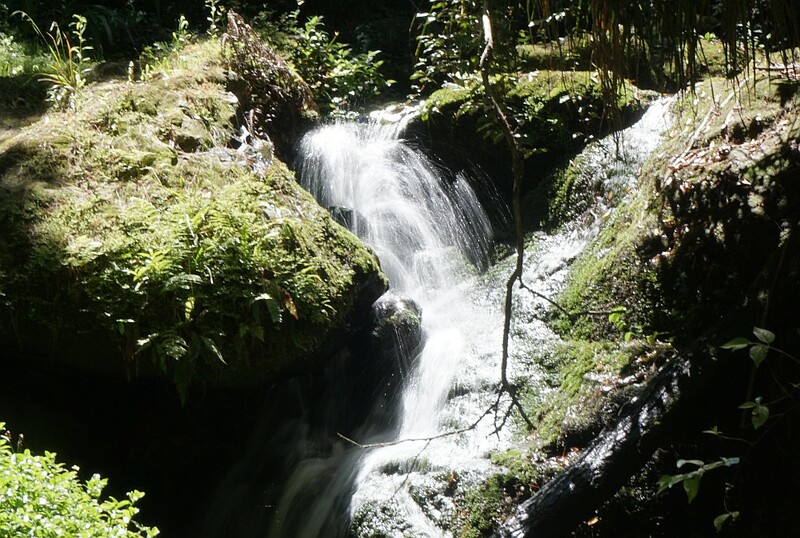 The small natural water ‘fountain’ has been there for several years, alongside the Scotsman Gully Track. 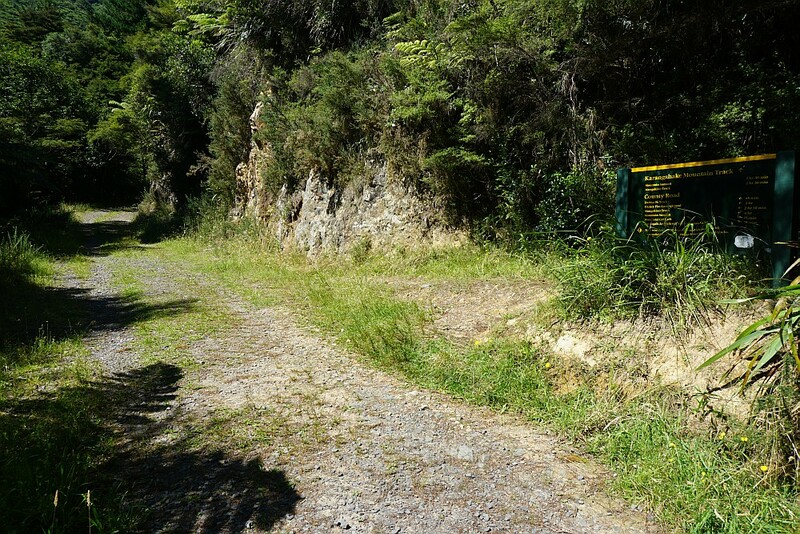 The sign at the end of Scotsman Gully track, near the parking area on Crown Hill Rd, and at the start of the County Rd track. The Mountain Track turns off a short distance along County Rd. County Rd track continues on to Dubbo 96 Track (used in the loop walk from Dickey Flat to Karangahake and back), Mangakino Stream Track, and on to the summit of Mt Karangahake. 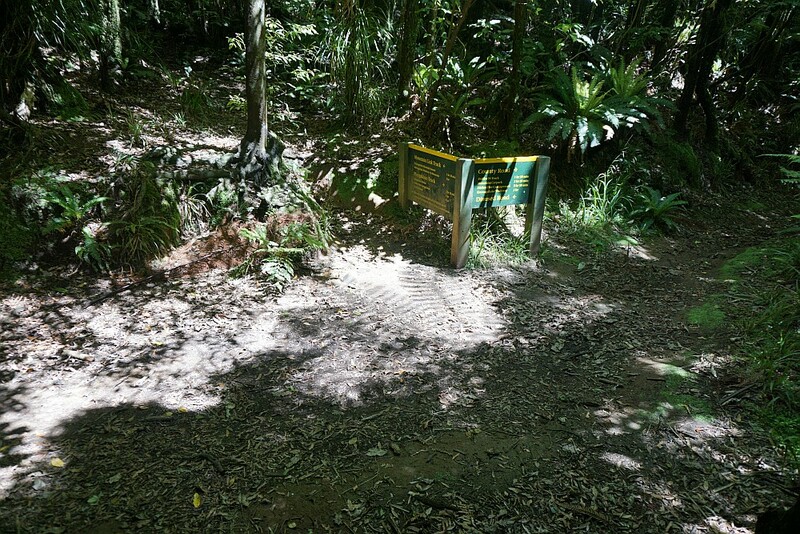 The Mountain Track turnoff, with the sign shown in close up above. Only about 100m further along County Rd the track makes a turn to the right, and is now also named the Number 7 Level Track. The road continuing straight ahead is marked as Number 8 Level, and having no public access. Although someone has defaced the sign so it reads public access instead. The track provides occasional peeps to the summit. And in the other direction views to the Waitawheta River and beyond towards Waihi. The Dubbo 96 Track, leading to Dickey Flat, branches off the County Rd track. The track to the summit continues along County Rd/Number 7 Level Track. 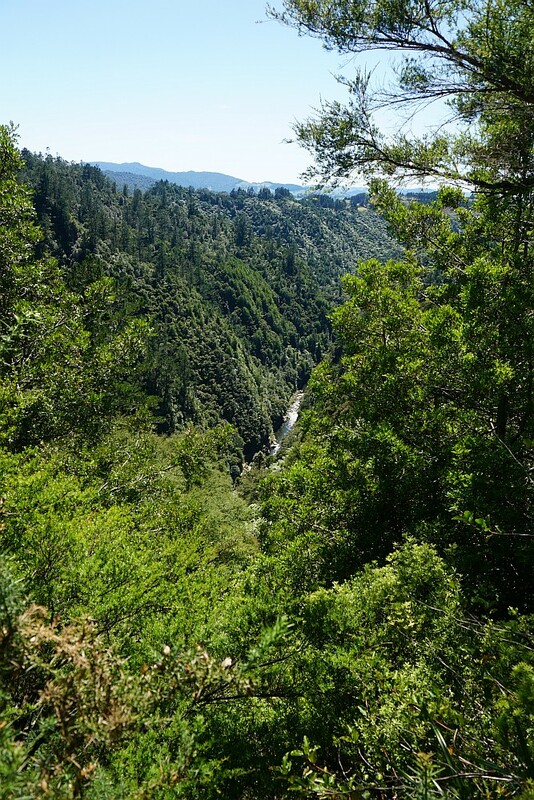 From this part of the track there are also occasional views through or over the vegetation. 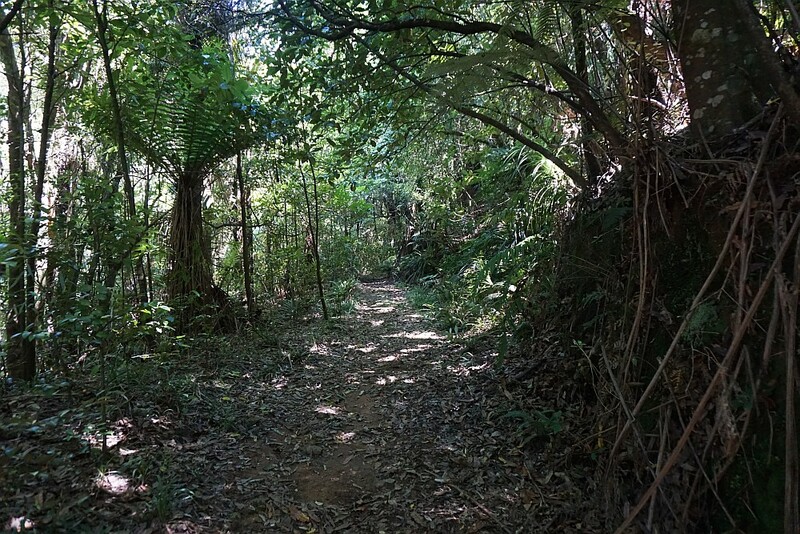 The track is well formed, with a gentle gradient, passing through regenerating native bush. 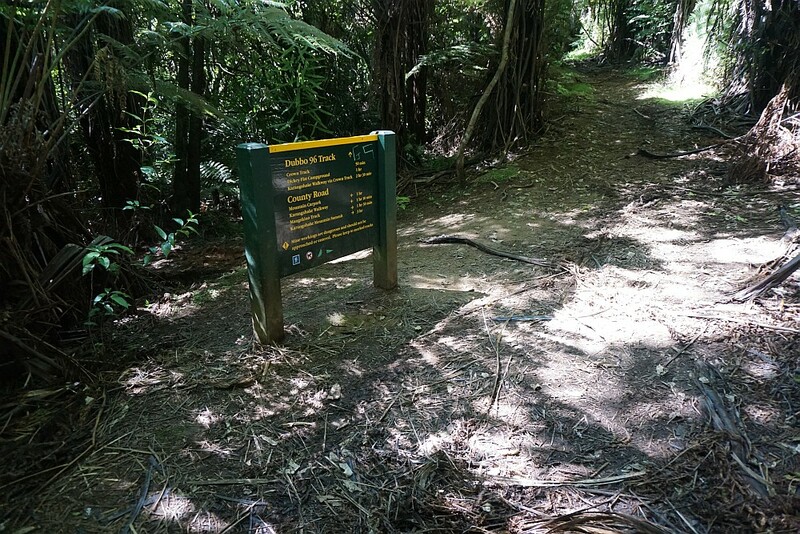 The sign at the junction of Mangakino Stream Track, County Rd, and Mountain Link Track. 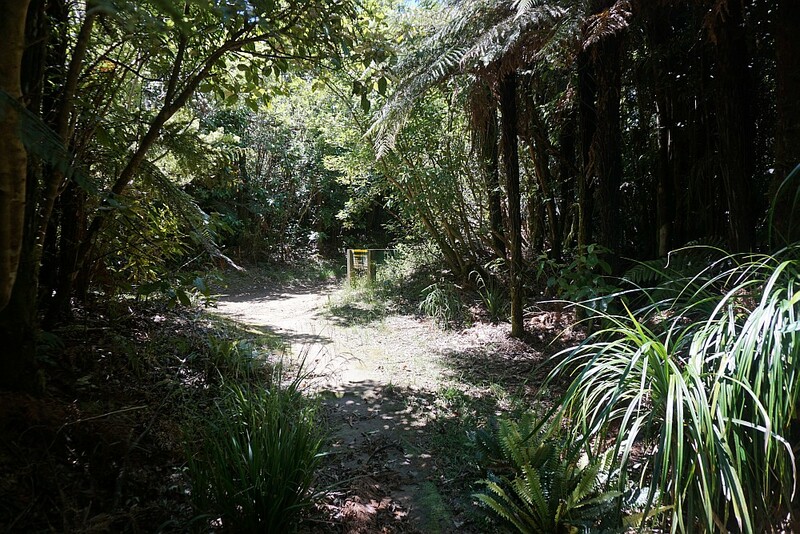 The junction of Mangakino Stream Track, County Rd, and Mountain Link Track. 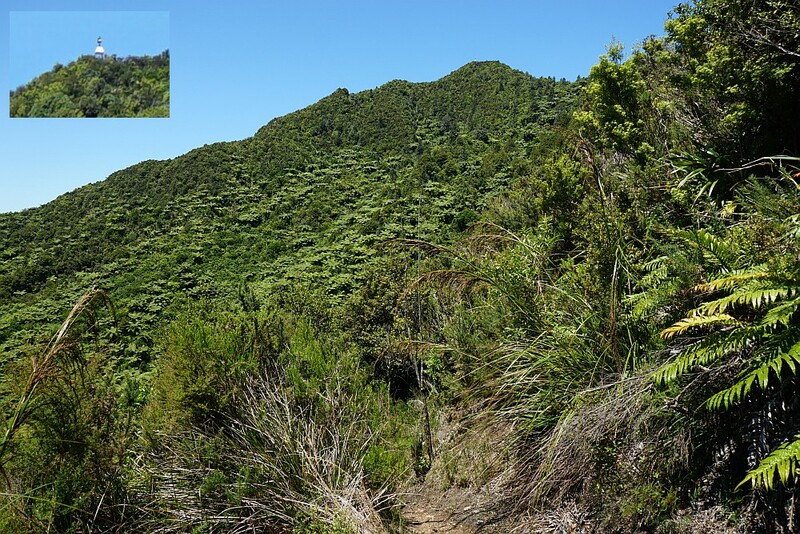 The approach on County Rd track is to the right, Mountain Link Track is straight ahead, County Rd continues to the left as an unused road or track, and Mangakino Stream Track starts at the bottom of the photo. 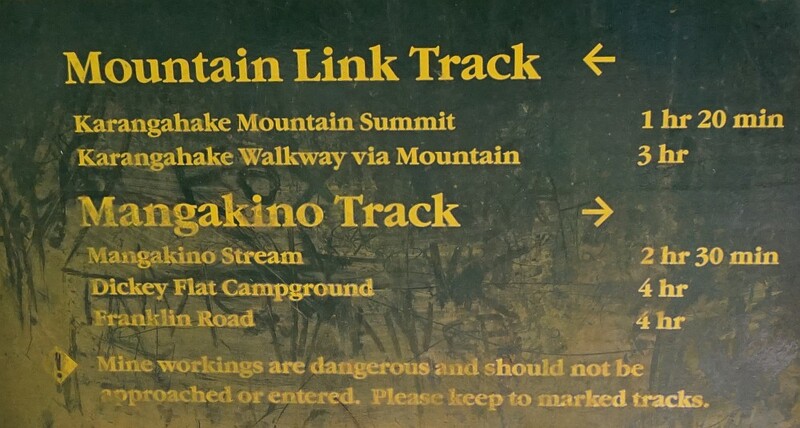 A very old track sign on the Mountain Link Track. The track is now marked with the usual DoC orange triangles nailed to trees. 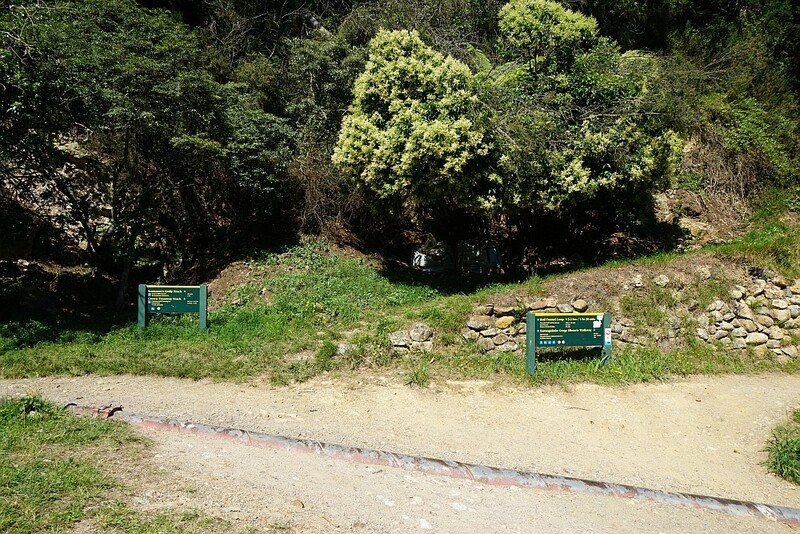 The junction of Mountain Link Track and Mountain Track. 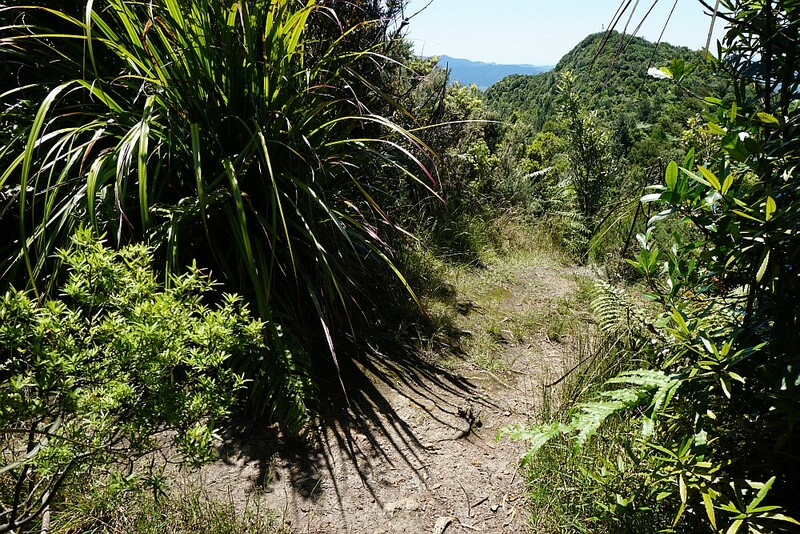 The track to the summit is on the right, the track back to Karangahake on the left. Looking across from the short track to the communication station to the trig station on the prominent 544m high peak. The track to the trig station is unmarked but easy to follow. A short distance from the comms station track there is another unmarked and slightly hidden track on the left, the start of a shorter and steeper track back to Karangahake. This is the track used on this walk to return to the carpark. 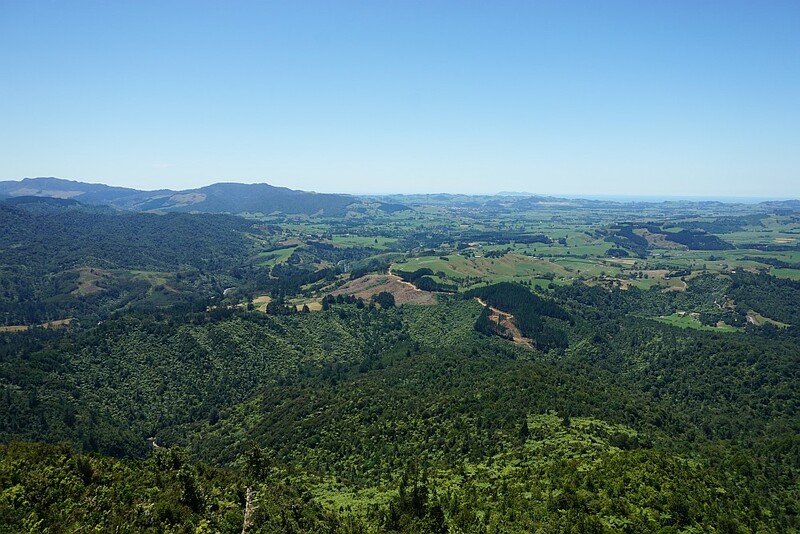 View from the trig station to Karangahake, the Ohinemuri River, and on to Paeroa, with the Firth of Thames in the distance. 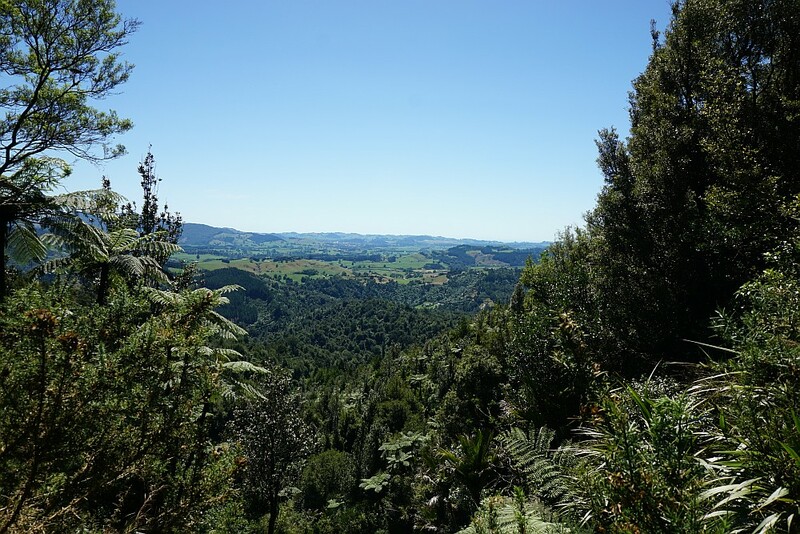 View from the trig station towards Waihi. Mayor Island / Tuhua can be seen in the far distance, just to the right of centre. 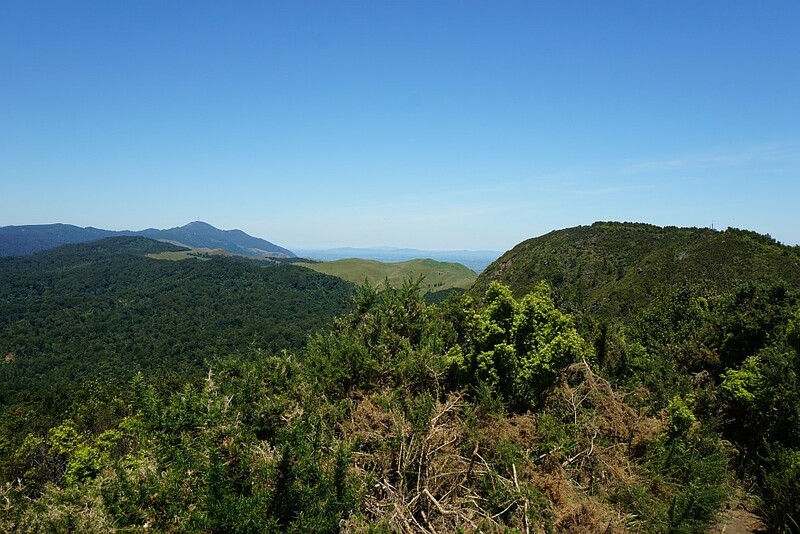 View from the trig station towards the comms station and Mt Te Aroha left of centre with the mast on top. 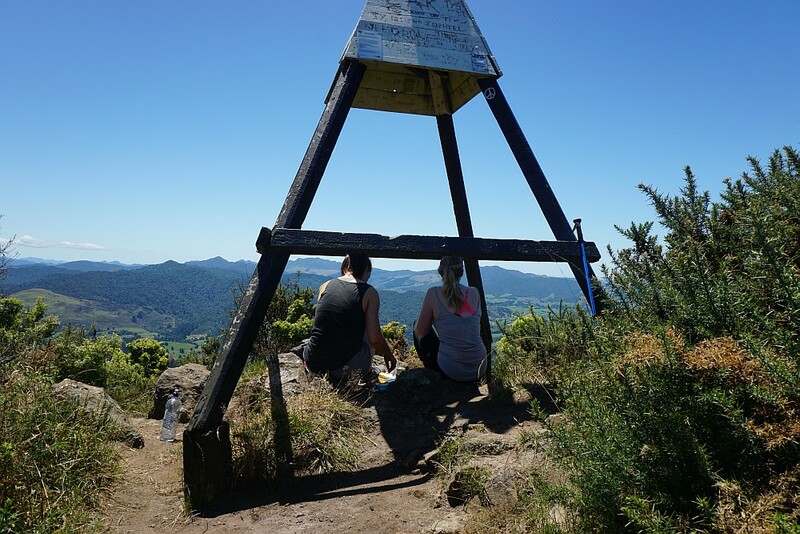 Two young women enjoying some shade and the view from the trig station after a climb up the Mountain Track in hot weather. 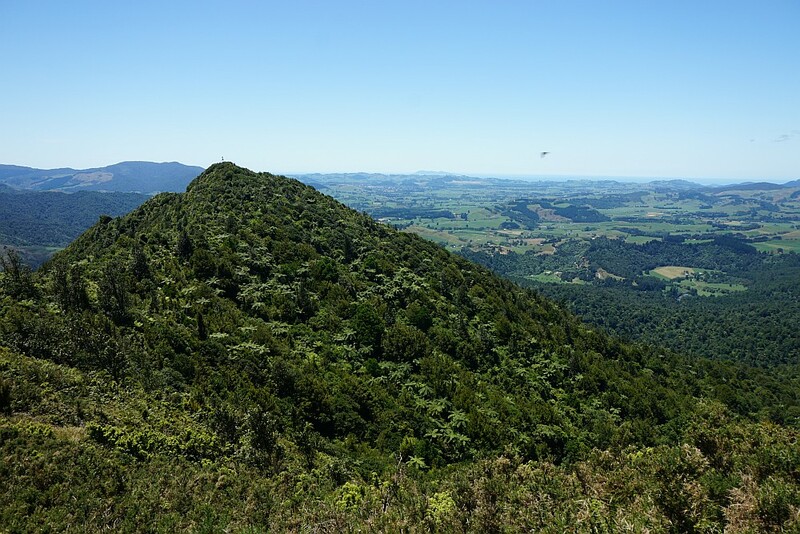 View of the trig station summit from the steeper direct track heading back to Karangahake. The inset at top left shows the trig station in a clip from the original photo in full resolution. 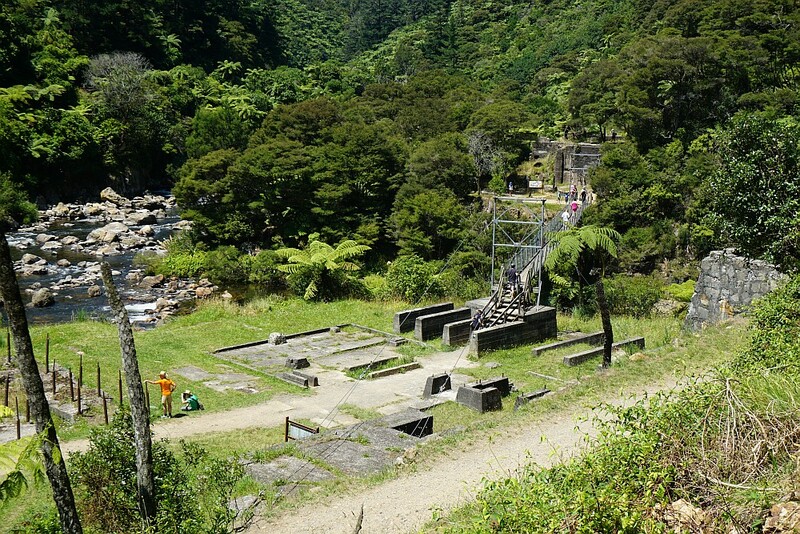 View from the end of Scotsman Gully track, with the suspension bridge across the Waitawheta River, where it runs into the Ohinemuri River, and remains of the old gold processing plants. 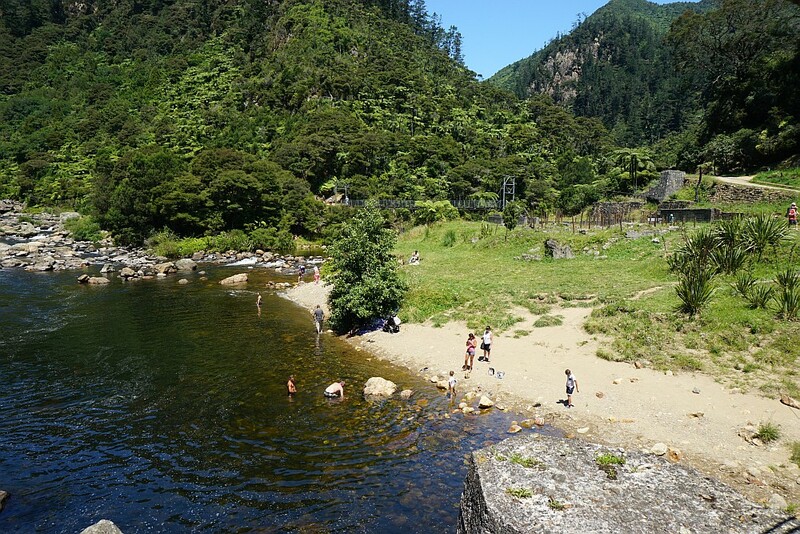 The Ohinemuri River is popular for cooling off on hot summer days. Karangahake to Dubbo 96 Track via Scotsman Gully: 2.9 km, 50 minutes. Dubbo 96 Track to Mangakino Stream Track: 3.4 km, 1 hour. 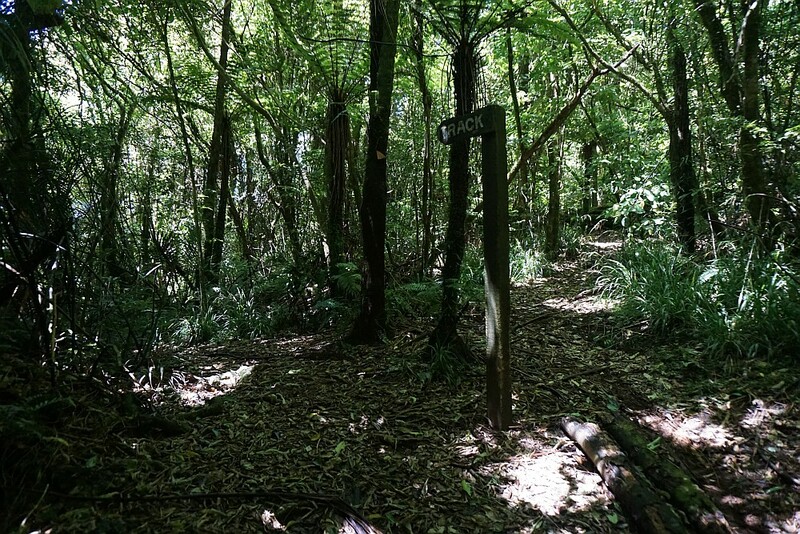 County Rd/Mangakino Stream Track to trig station: 2 km, 40 minutes. 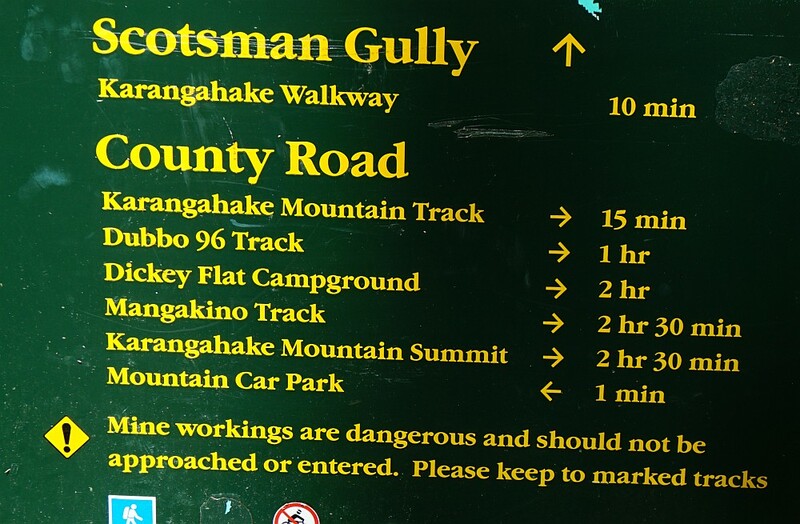 Trig Station to Karangahake via direct track and Scotsman Gully: 3.3 km, 1 hour. 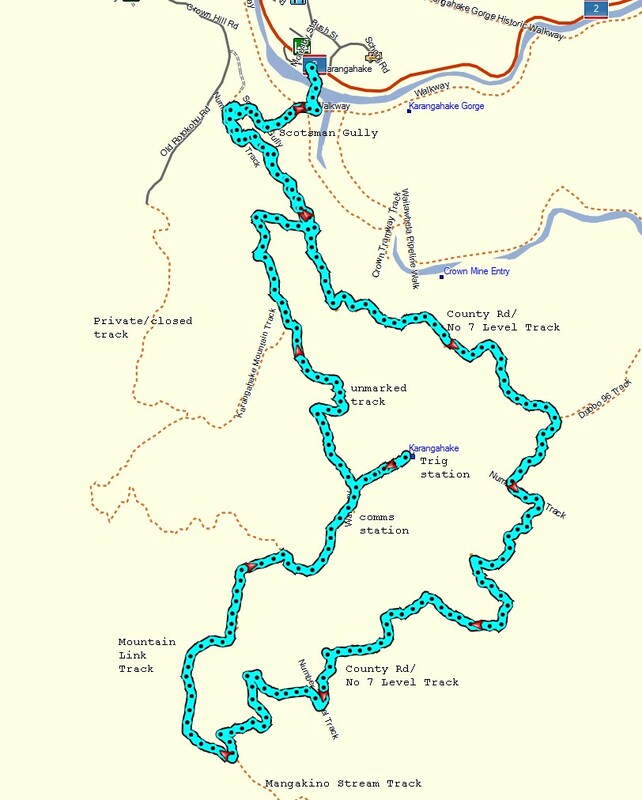 Total walking time 3 hours 30 minutes, plus 35 minutes for a lunch break and time spent at the trig station peak. Total distance about 11.6 km. Total climb is about 500 metres from the carpark to the summit, with only a shorter downward slope on County Rd between Dubbo 96 Track and Mountain Link Track. 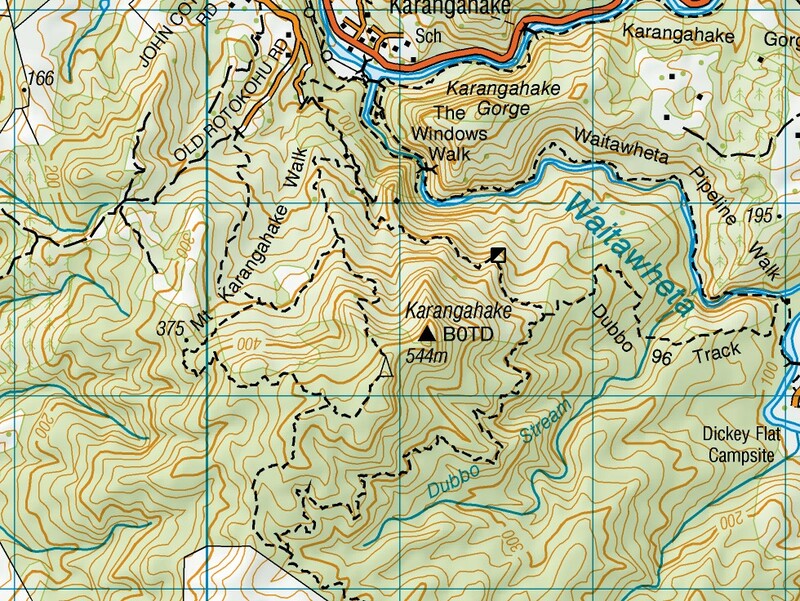 Topographic map of the area around Mount Karangahake, showing the tracks used, including the direct return track, but not the short track to the trig station peak (marked as BOTD, the trig station code). The track was walked on January 23, 2016.